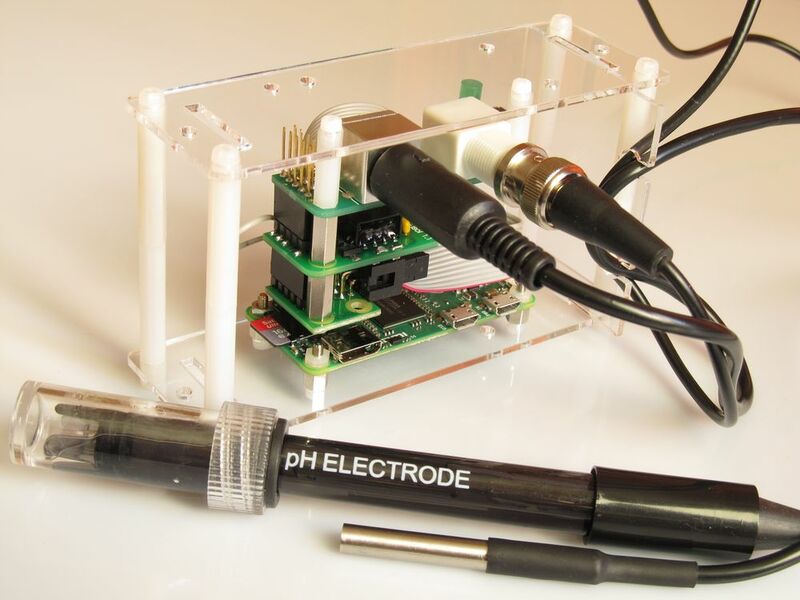 The HomeLab-pH is a circuit board for pH measurements. 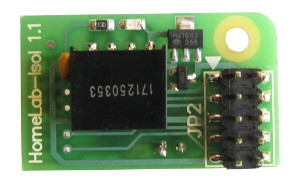 It is used in tandem with a computing module, usually - Raspberry Pi mini-computer, Arduino controller or ESP8266 module. Accurate and stable voltage reading ensures a resolution of 0.01 pH over the 0 – 14 pH range. 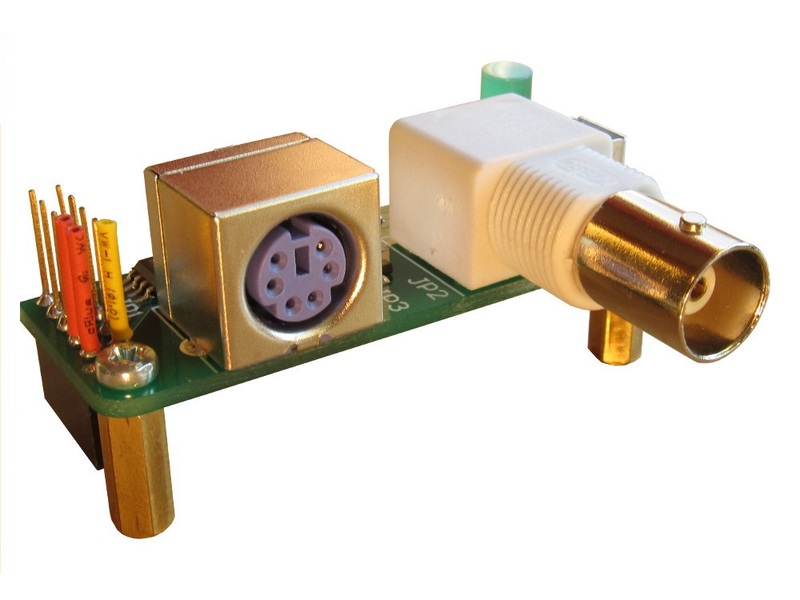 A digital temperature sensor to compensate pH for temperature impact (ATC). A LED and a button for user interaction. 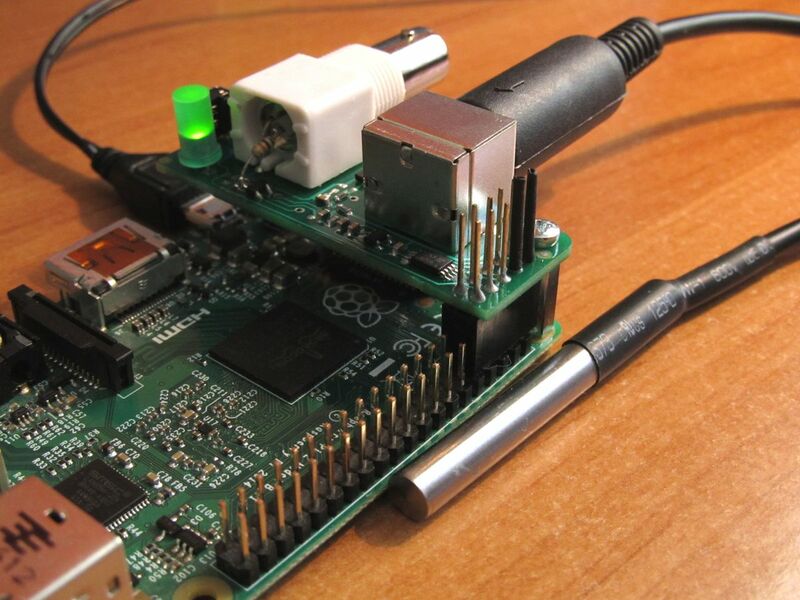 Various pieces of software for Raspberry Pi and Arduino provide visual, command line or remote interfaces to show and log the measured data and to calibrate the board. 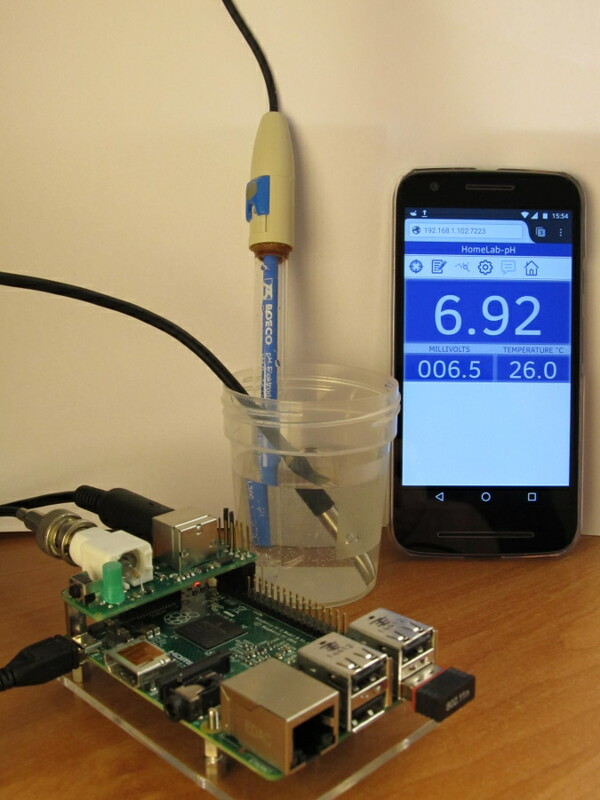 Periodic unassisted measurements with Raspberry Pi at time interval between 5 min and 24 hours. See a detailed board specification. The HomeLab-pH board lacks a processor, so it has to be connected to an external CPU board to do the calculations. This site shows how to connect to and use HomeLab-pH with an Arduino controller or as an expansion board to a Raspberry Pi (RPi) or compatible mini-computer. There is a more detailed description of the board capabilities to help those aimed at an integration with different types of processing boards. Note that, to do pH measurements, a combination pH-electrode and calibrating buffers have to be available in addition to a processing unit. 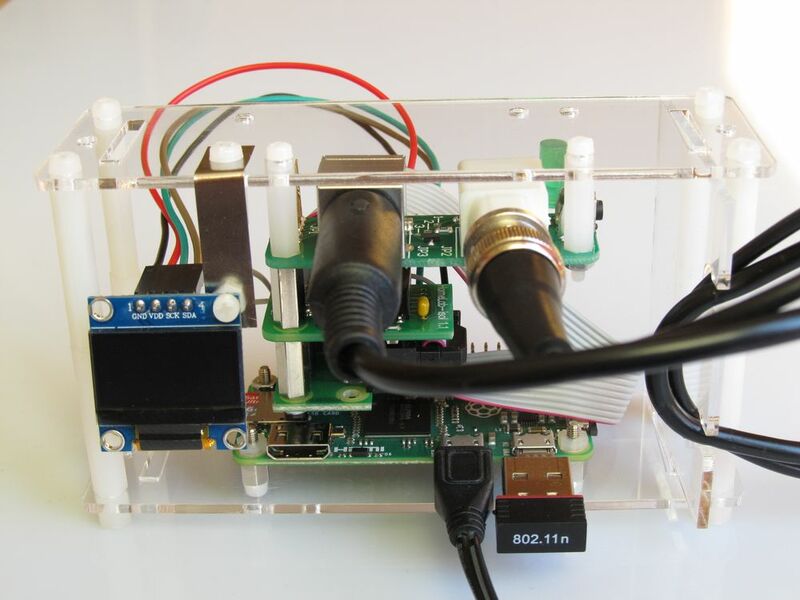 For reading, controlling and calibrating the pH module we prepared various software packages to be used with Arduino controller or with Raspberry Pi and its compatibles. Evidently the packages are somewhat different in their capabilities. 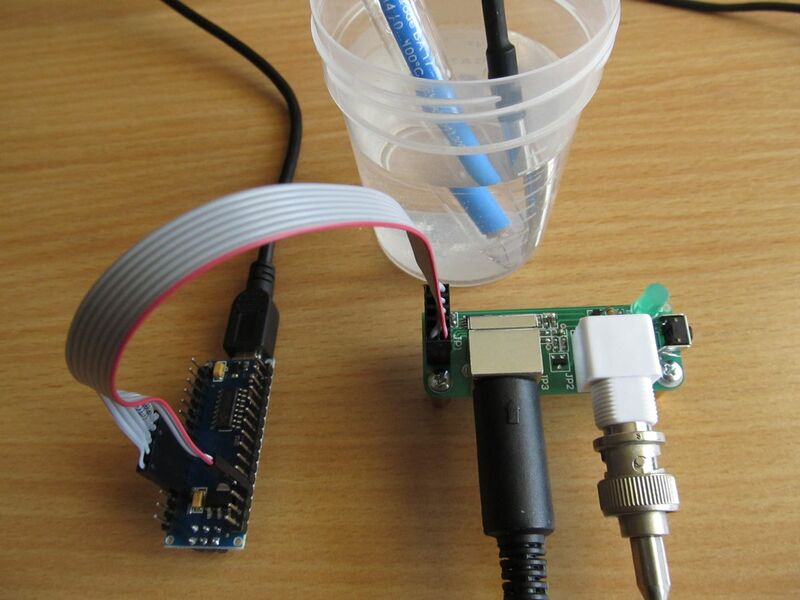 It is somewhat tricky to measure pH in volumes where immersed appliances leak direct electric current into the liquid. Due to the very high input impedance of the pH-probes these currents, even small, may impact the measurement and result in unstable or shifted pH value. This is the case with aquariums where immersed air or water pumps, heaters and lighting leak small electric currents through their insulating shells. 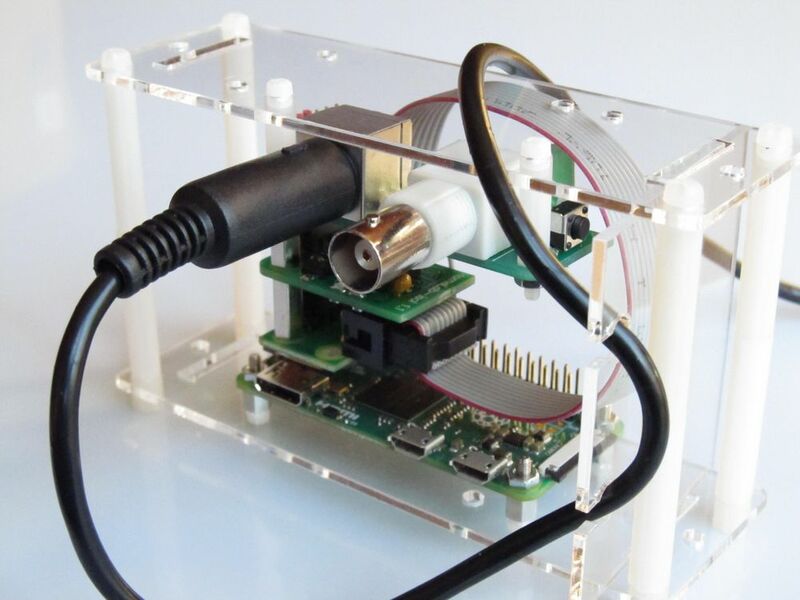 Aquarium owners or hydroponics enthusiasts interested in on-line pH-measurement may benefit of the functionality added by our HomeLab isolator module. When coupled with HomeLab-pH it assists the pH measurement by effectively filtering the interfering currents of the environment. It is a small size circuit board, which is to be mounted between the computing board (PRi, Arduino) and the HomeLab-pH module. 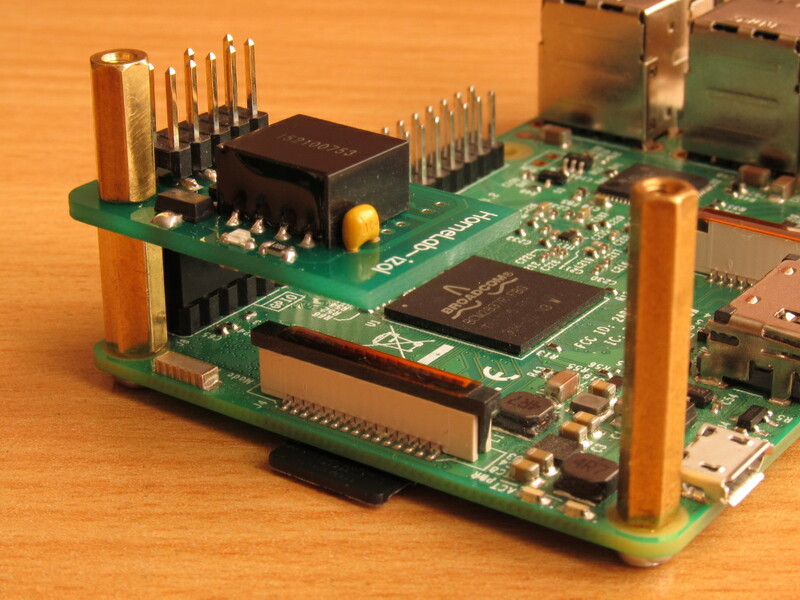 This is a specification of board revision 3. For earlier revisions see Rev.1.1 or Rev.2 . The following data concerns measurements. This data is valid when the board is used with the software provided at our site. * Note: When using a good meter, as HomeLab-pH is, the inaccuracy of pH measurements will then be mainly affected by three factors: the quality of the pH-electrode, the precision of the calibration and the temperature difference between the measured sample and the calibration buffers. Here a general value for inaccuracy is given. It refers to measurements made with a good quality electrode, calibrated by a standard 2-point procedure. Also, the buffers inaccuracy is assumed to be not greater than 0.02 pH units and their temperature difference with the sample to be less than 5°C. If calibration buffers of ± 0.01 pH are used, the inaccuracy of the measured pH value will be as low as 0.03 pH. 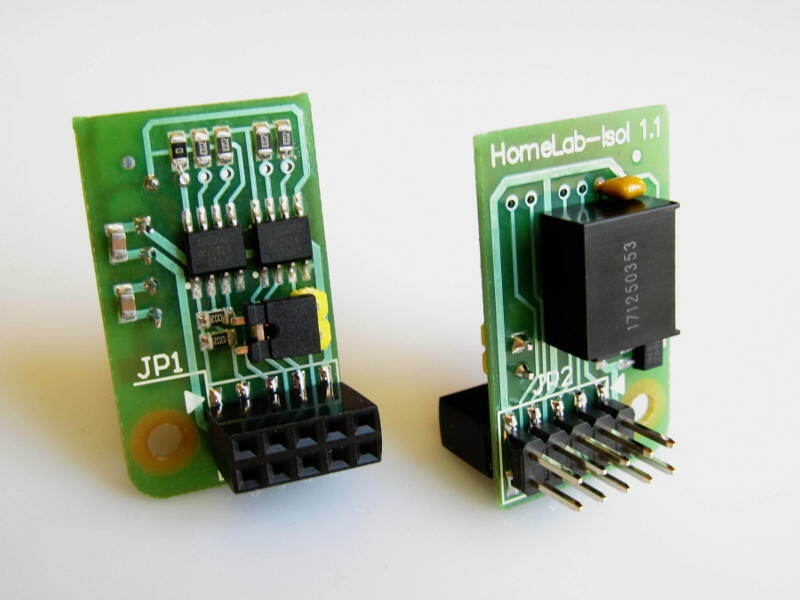 You may purchase a HomeLab-pH or a HomeLab-Isol module at eBay or Tindie. Current HomeLab-pH revision is 3. When purchased alone the HomeLab-Isol comes with a spacer (12 mm), screw (M2.5) and a nut. CAUTIONAvoid to mount or dismount the HomeLab-pH board when powered. You risk to damage the meter. Always switch off the data processing unit in advance. Please, follow strictly the directions below. If an isolator module (HomeLab-Isol) is to be used as well, prepare it to be placed between the RPi and the HomeLab-pH module. First screw tightly two of the shorter spacers through the module's mounting hole. RPi has 4 mounting holes. We need only the two of them located on the side opposite to the USB and LAN ports. Fix the two supplied spacers using the screws provided and a screwdriver. 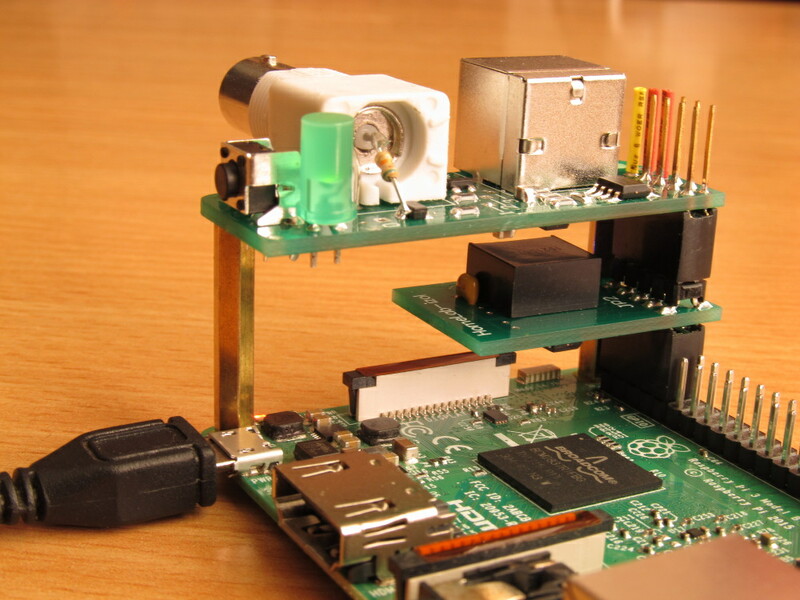 Instead, if a HomeLab-Isol module is prepared at point 1, mount it on the left-hand mounting hole of the RPi. 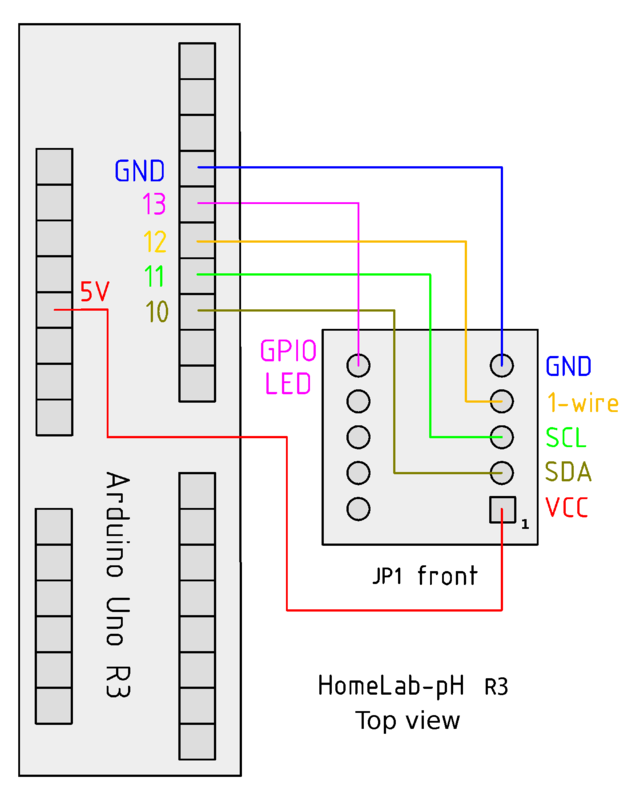 Insert the pins of the first 5 rows of the RPi header into the module's JP1 female header. The longest spacer fix on the right-hand side mounting hole. 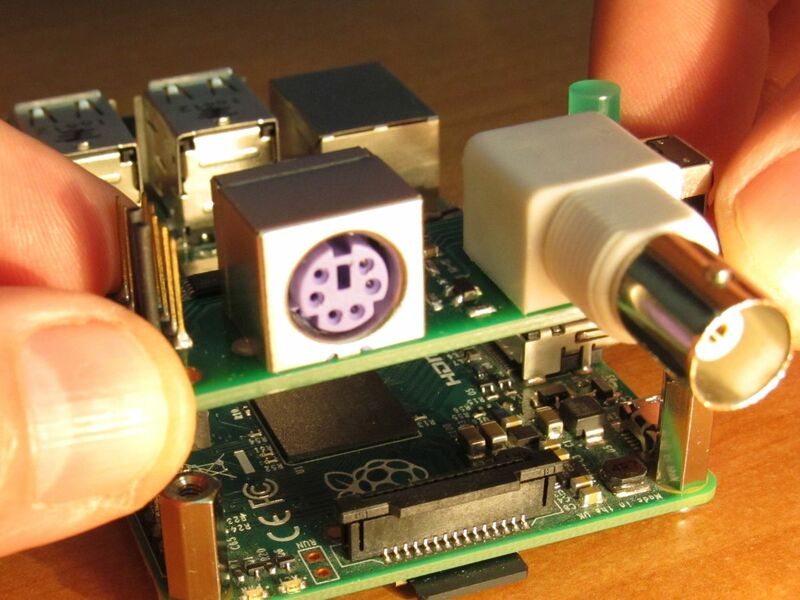 Put RPi on a flat surface. With your thumbs and pointer fingers hold horizontally the HomeLab-pH board by its 4 edges so that its black socket points downwards. (Try not to touch any of the soldered elements.) Lower down the board carefully so as to insert the first 5 rows of the RPi pins into the holes of the board's black socket. If the board is inserted correctly it will lie with its 2 mounting holes being just on top of the spacers. Place the remaining 2 screws through the board mounting holes and screw them into the spacers' holes. 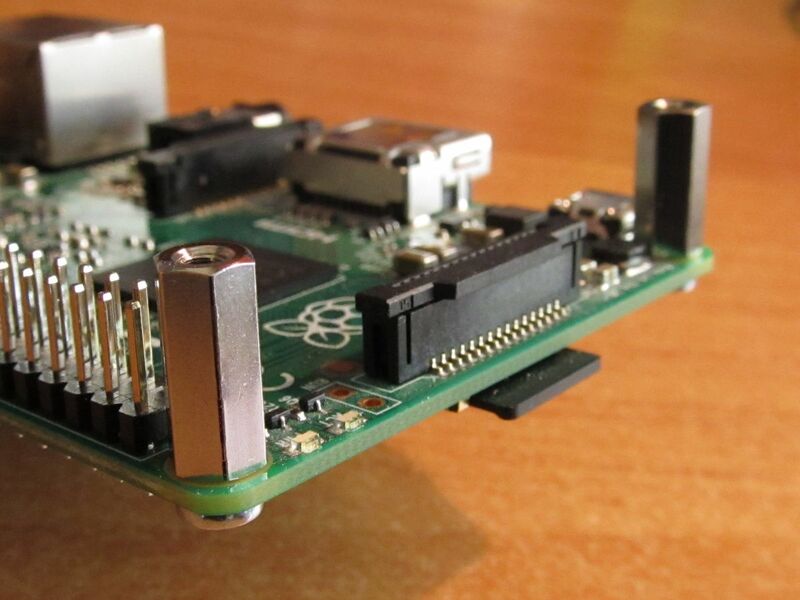 When finished check that the board is solidly mounted on the RPi. 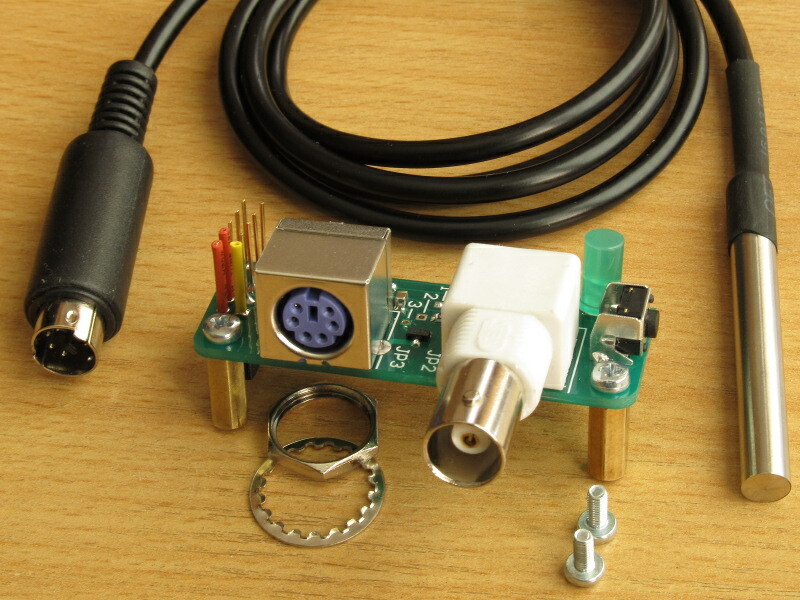 Insert the temperature sensor plug into the mini-DIN socket of the board. Please, do not apply excessive force and make sure the arrow mark on the plug is on top. 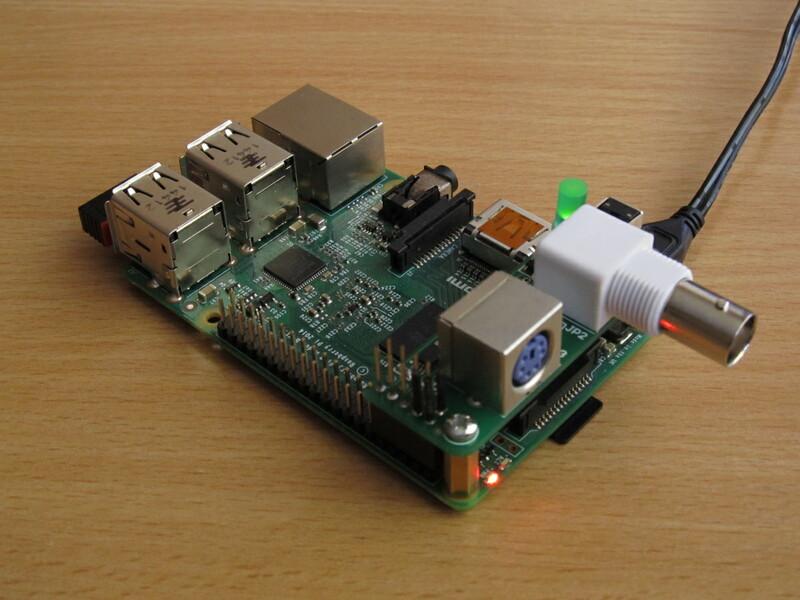 Power on the Raspberry Pi. You should see the green light of the LED on the HomeLab-pH board. 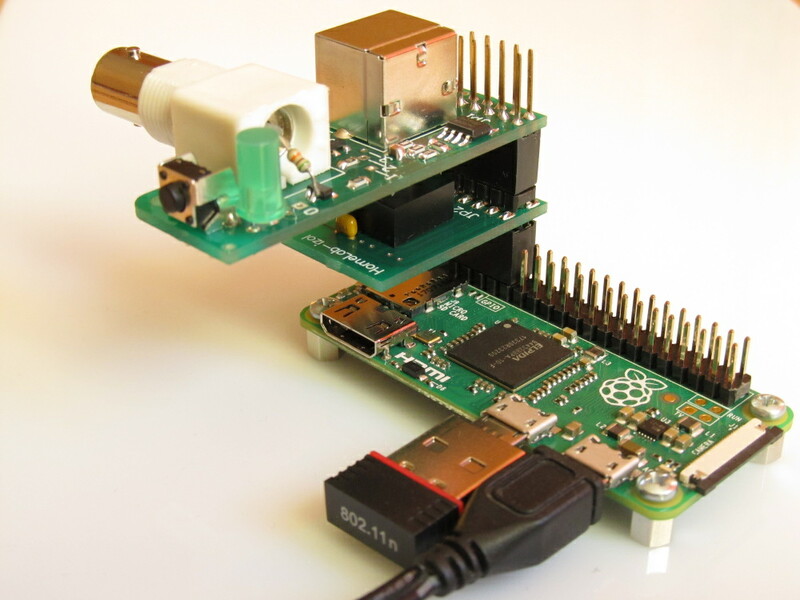 Mounting on Raspberry Pi Zero is even simpler as only one of the mounting holes is used. The coupling is stable despite the missing column on the far side of the pH-board. 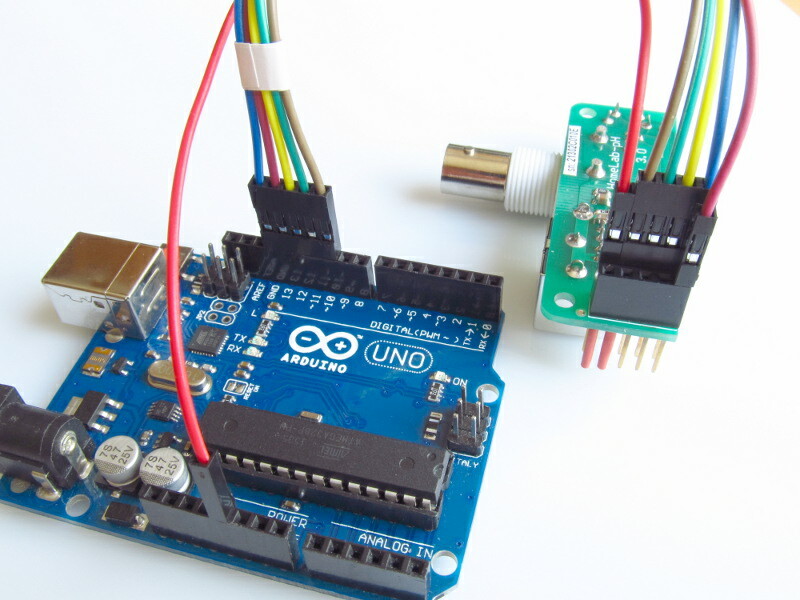 Note that to control and read the HomeLab-pH board we provide free software for Arduino IDE. 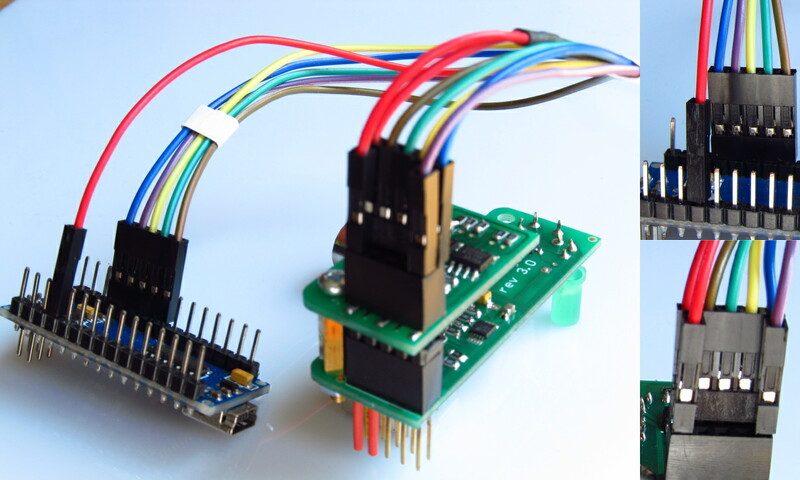 The software is applicable both for Arduino controllers and ESP8266 modules. The IDE is also offered free at their site. 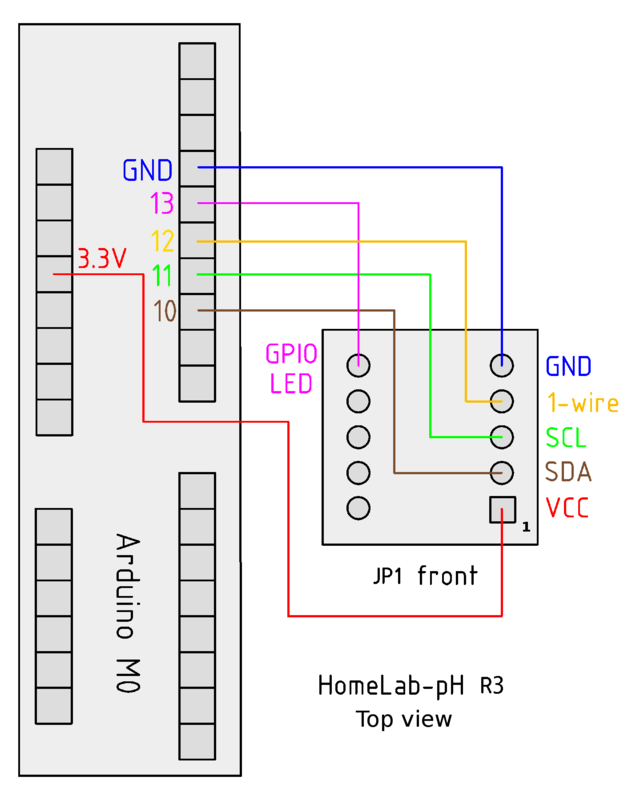 CAUTION This chapter is about wiring HomeLab-pH board Revision 3 to Arduino controller. For previous revisions visit Rev.2 . The revision number is printed on the bottom side of the board. These hardware requirements exclude from support the following Arduino boards (non-exhaustive list): Gemma, NG, Mini V3 & V4, Nano V2, Diecimila, Duemilanove (ATmega168), Fio, Esplora, Pro (3.3V). Pictures of connected devices and diagrams of the wiring are shown below. 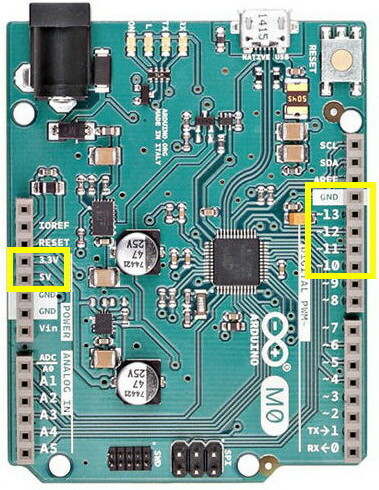 Note that any set of 4 Arduino digital pins are suitable to connect the board's SDA, SCL, 1-wire and LED pins. The wirings shown in the diagrams are a good choice because 1.the pins are conveniently positioned for a ribbon cable connection and 2.their GPIO addresses are coded in our software (these can be altered if needed). 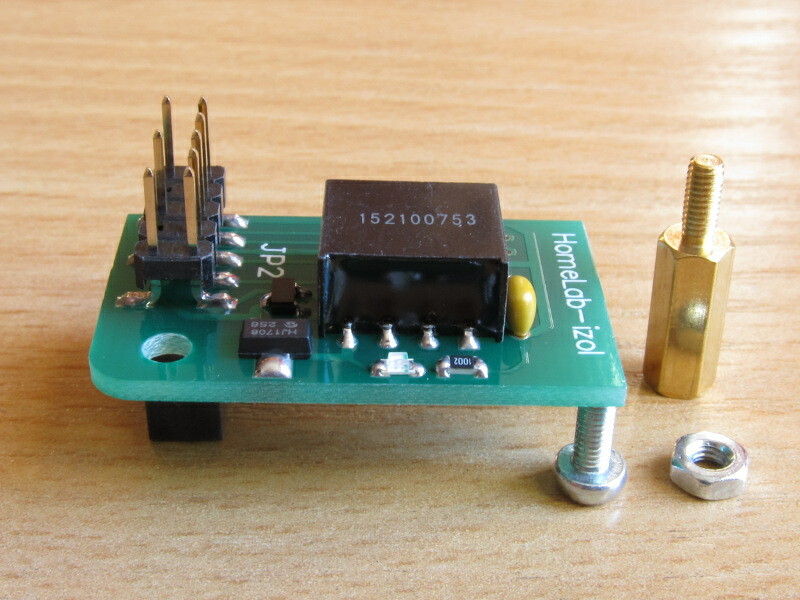 Wirings with a HomeLab-Isol digital isolator mounted in-between are shown separately as this module works at 5 V and requires an additional wire. Click/tap on the images for a larger view. HomeLab-pH bottom-side wiring. 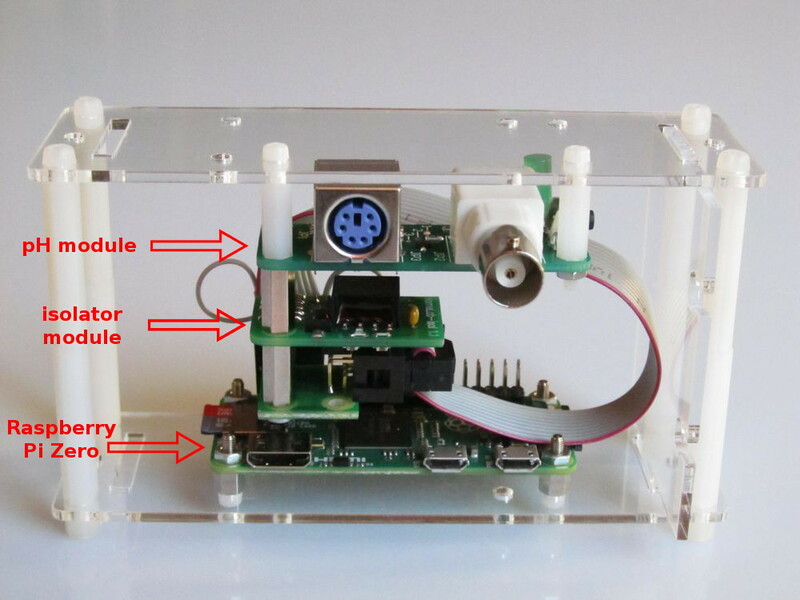 This wiring scheme is applicable for models Nano V3, Mini V05 and Micro. HomeLab-pH connected to Arduino Uno by the female part of its stackable JP1 connector. This wiring scheme is applicable for models Uno, Mega, BT, Ethernet, Leonardo, Pro (5v) and Duemilanove (ATmega328). 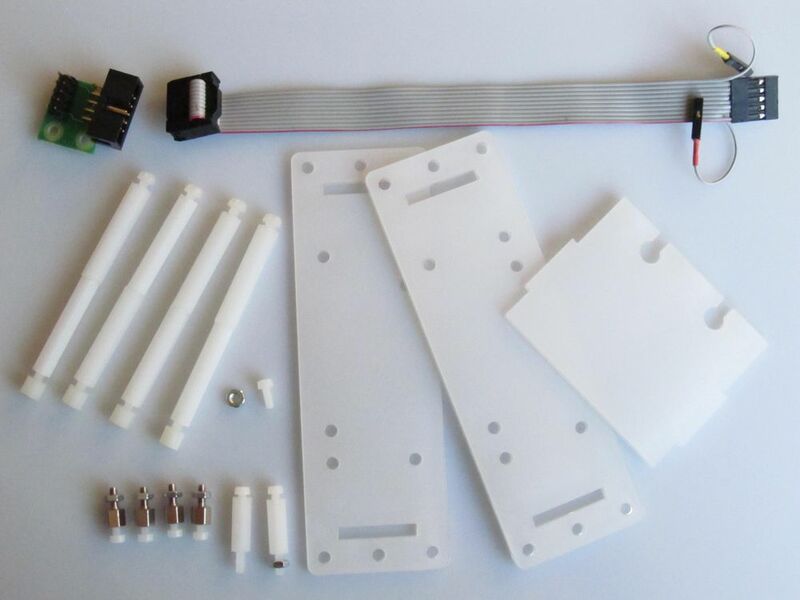 The wiring scheme is applicable for models M0, Zero, Due and Tian. 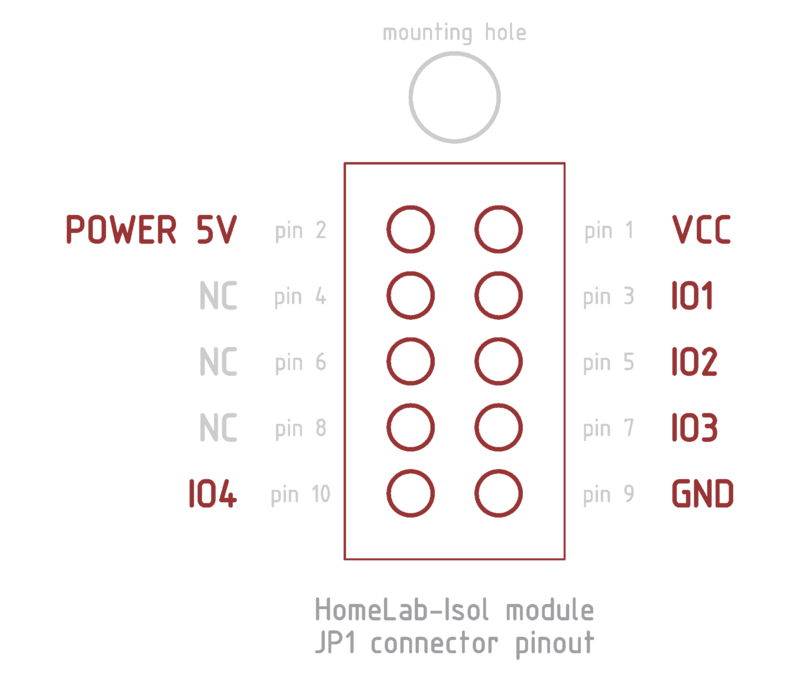 It is the quite the same as that for the Uno the only deference being module's VCC connected to Arduino 3.3 V power pin instead to 5 V.
Note the additional wiring needed to supply 5V to the POWER pin of the HomeLab-Isol JP1 connector. 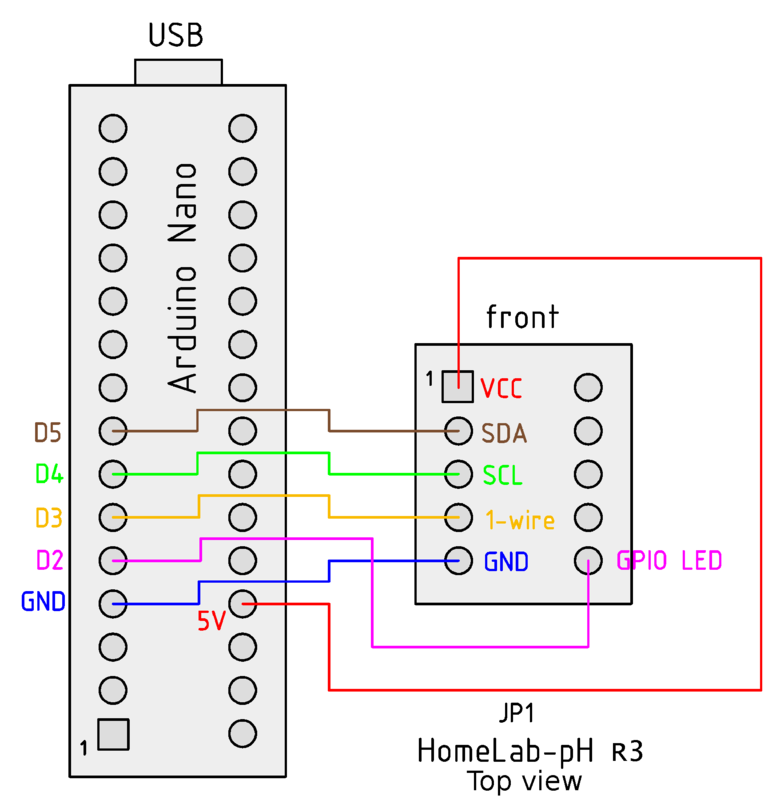 Connecting HomeLab-pH to Arduino Nano. Connecting HomeLab-pH to Arduino Uno R3. Connecting HomeLab-pH to Arduino M0. CAUTION During the wiring be careful to switch off in advance the power of the controller. 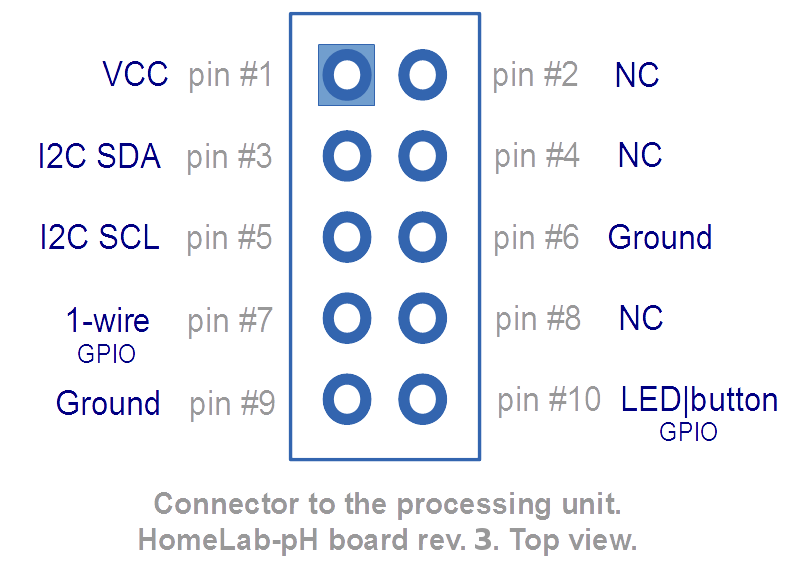 Pay particular attention to the HomeLab-pH power pins: GND and VCC. We recommend to connect the GND line before any other line is connected. 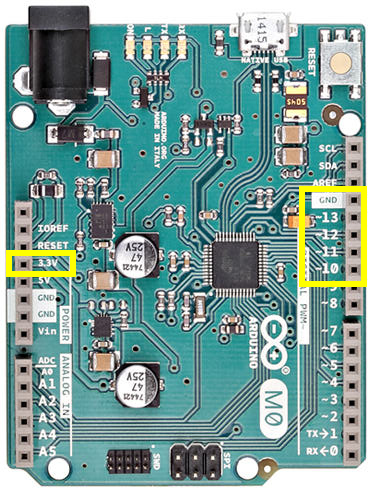 The VCC pin should be connected to +3.3V or +5V depending on VccIO (VddIO) of the Arduino controller. Supplying voltage lower or higher than this can damage either the board or the controller. An error in wiring a digital line most probably will result only in bad communication which the software can detect. This is a technical description of board Revision 3. For earlier revisions see Rev.1.1 or Rev.2. In this section we will give some details about the board. We hope they will be useful for those of you which intend to connect the board to a processing unit other than those supported by the software presented on this site. Data from three sources is needed to calculate the pH value of a sample - the voltage generated by the pH-electrode, the temperature of the sample and board specific data available for retrieving from the on-board EEPROM chip. These data sources are shown on the functional block diagram below. The board has two sensor sockets - a BNC socket for the pH-electrode and a mini-DIN for the temperature sensor. The voltage coming from the pH-electrode is amplified and then digitalized by an ADC chip. An outer processor board should read this data by setting properly the ADC chip and converting the readings to pH. As the pH values are temperature dependant some additional correction should be calculated according to the data coming from the temperature sensor. Functional characteristics vary among the boards due to small differences between the elements used for the production. Although minute these differences do impact the final pH value when low inaccuracy of the measurement is the target. So the individual differences of each board are accounted for as we measure and put two coefficients in an on-board EEPROM chip. The pinout scheme of the header to couple the CPU board is shown below. 3 of the 10 pins are not connected (NC). 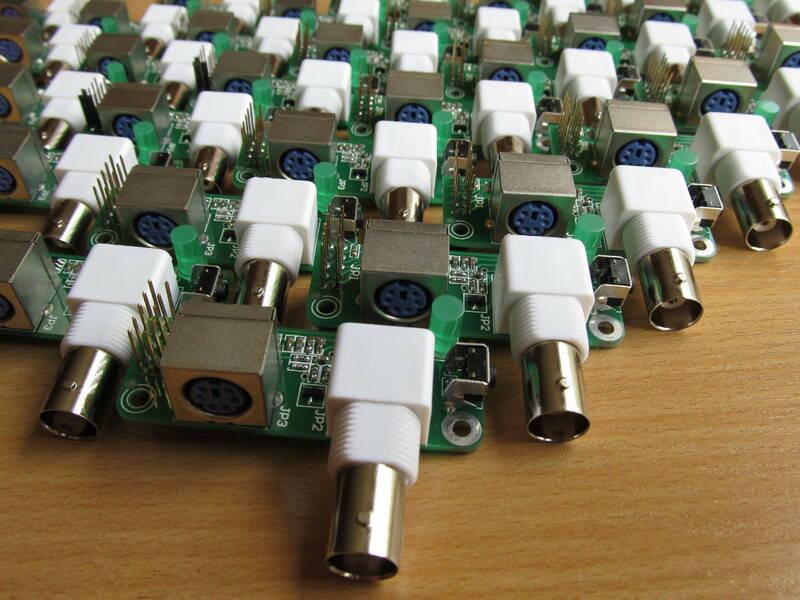 The rest follow the pins pattern of the Raspberry Pi header (P1). pin #1 The VCC pin. 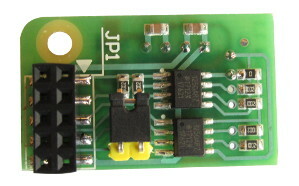 The board logic is powered through this pin from as low as 3.3 V (RPi) to up to 5 V (Arduino Uno). pins #3 & #5 These are for the I2C data exchange with the board's ADC and EERPOM chips. They are used to read the output voltage of the pH-electrode. 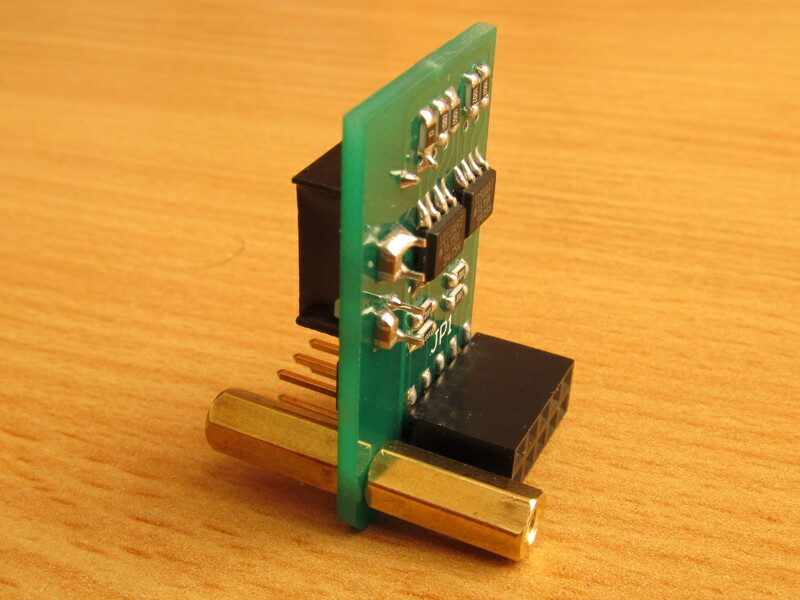 pin #7 This one is for reading the digital temperature sensor by means of 1-wire protocol. pin #10 There are a button and a LED on board. The LED can be set ON/OFF through this pin. Additionally, the button state can be read through it. 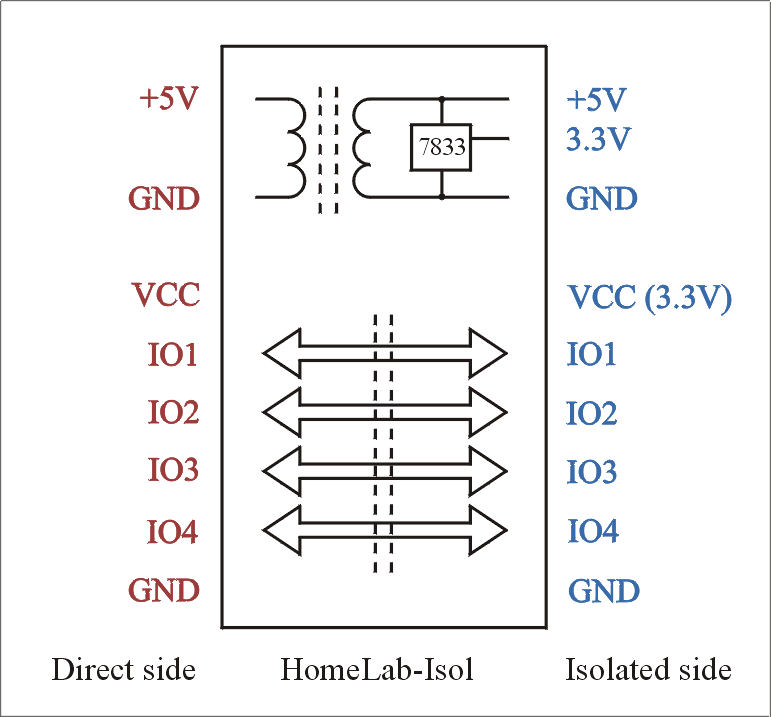 pH-electrode generated voltage is converted digitally by an ADC-chip. The digitalized voltage can be accessed by reading the output buffer of the chip. 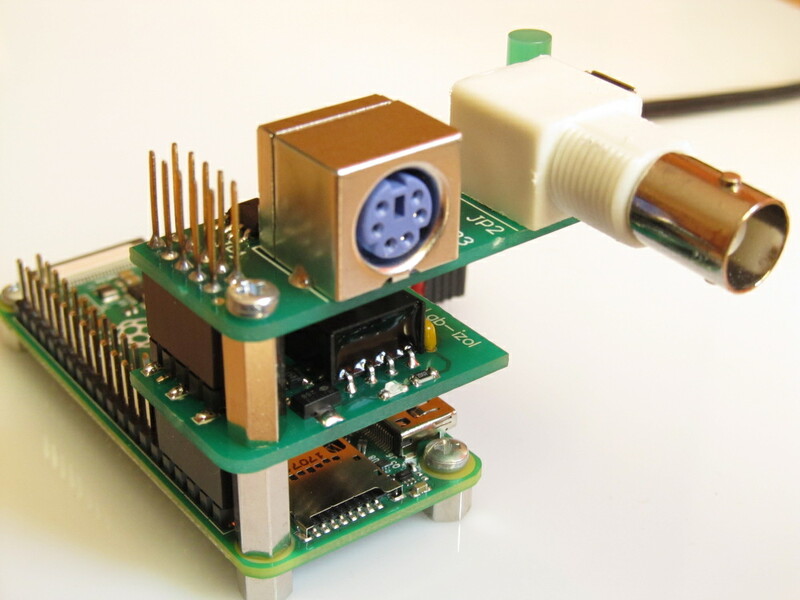 This can be done by means of I2C serial protocol. Note that the chip address is 0x49. The conversion data corresponds to differential voltage measurement between Ain0 and Ain1 channels. For detailed instructions how to get the data consult the ADS1015 data-sheet. raw_voltage is the digitalized output voltage collected by reading the ADC chip buffer. 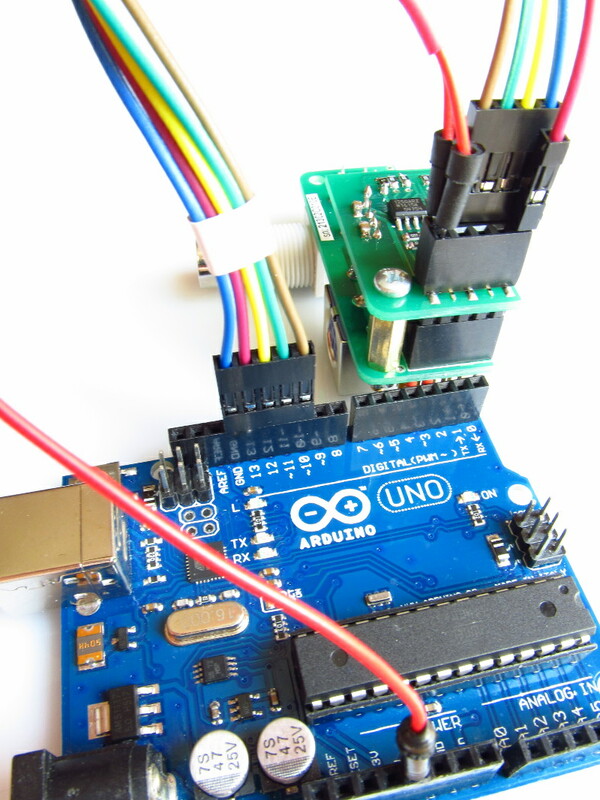 The software reads the offset and transmission values using the I2C protocol. Contact us for further details. 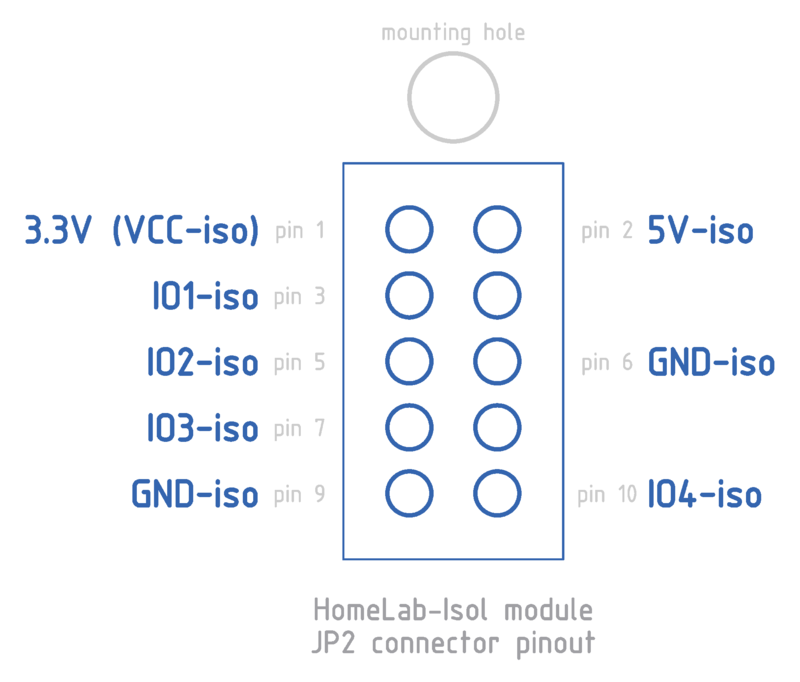 We developed the HomeLab-Isol module to assist the HomeLab-pH in giving stable and unaltered values when measuring pH in volumes with immersed electrical appliances. 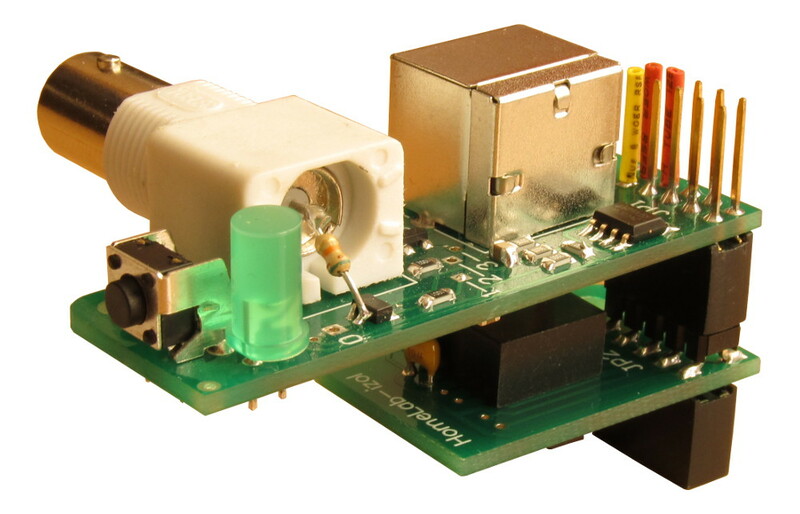 There the HomeLab-Isol effectively isolates both the power and the digital lines of the HomeLab-pH module. This small board has a wider usage area. 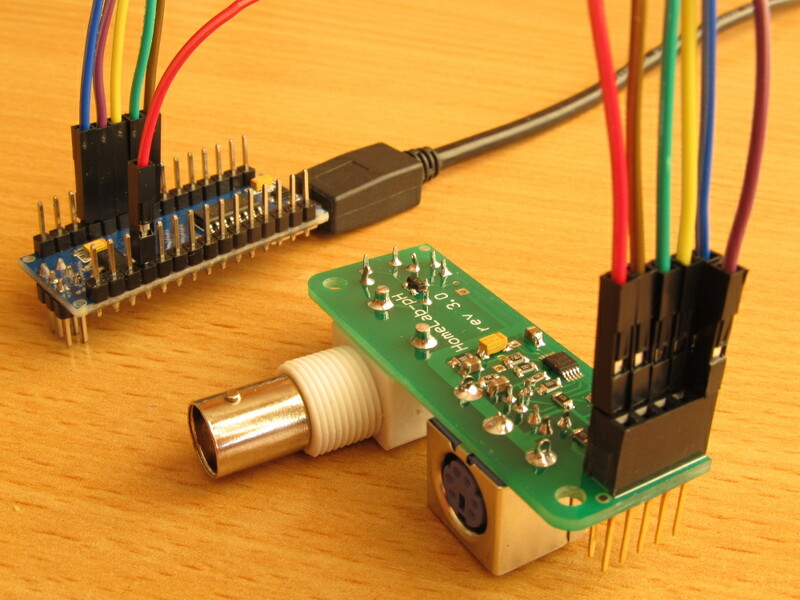 It is more generally applicable for isolation of data interfaces like I2C, 1-wire and SPI. 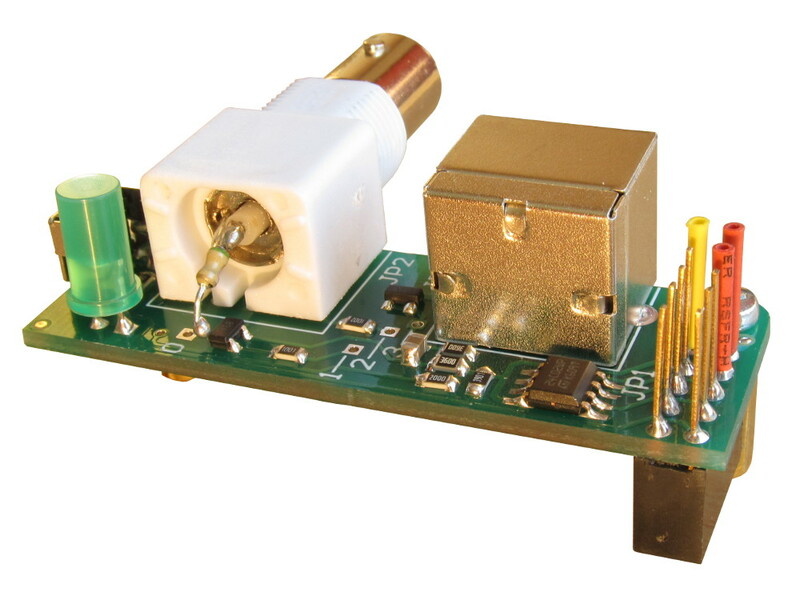 The module features 4 isolated bidirectional digital lines as well as an isolated power source. The lines are open-drain with 10K pull-up to VCC at the direct and at the isolated sides. 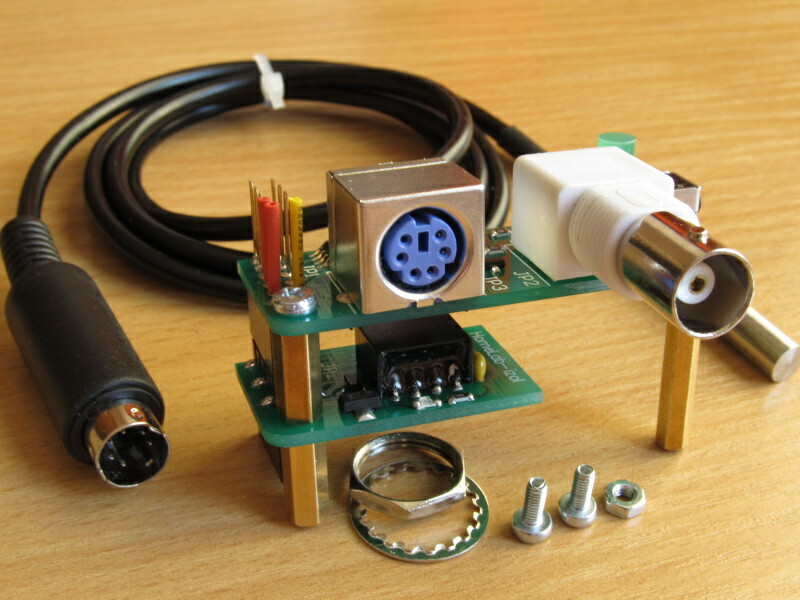 The module has input (JP1) and output (JP2) connectors placed opposite to each other on the direct and isolated sides respectively. Below are given the descriptions and the schemes of the connectors' pinout. 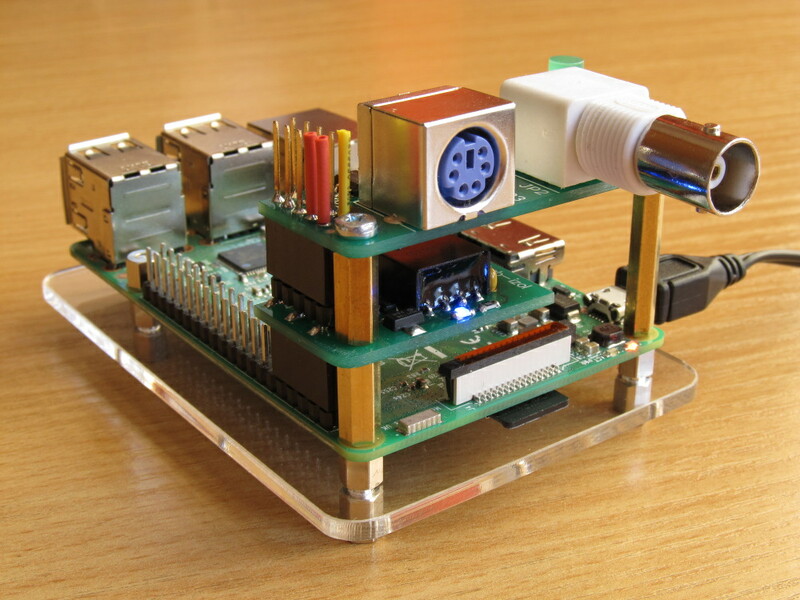 A special stand is available if Raspberry Pi Zero is to be used as a computing unit. 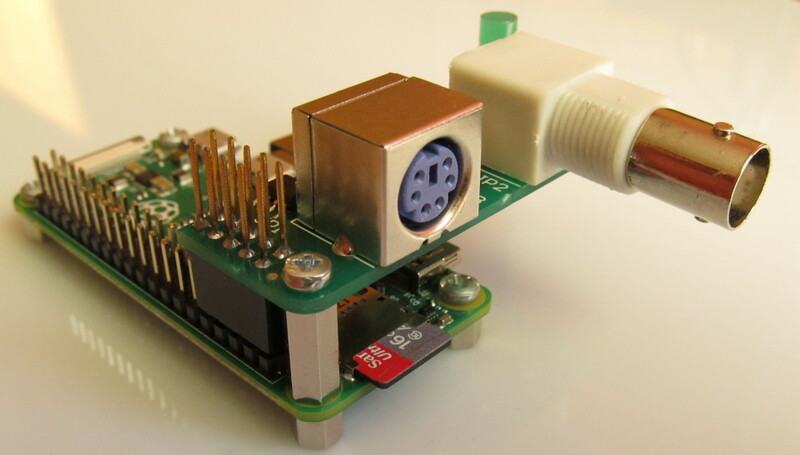 There is a set of a small connector board and a short ribbon cable to link the Pi to the module/s. See what is in the box. 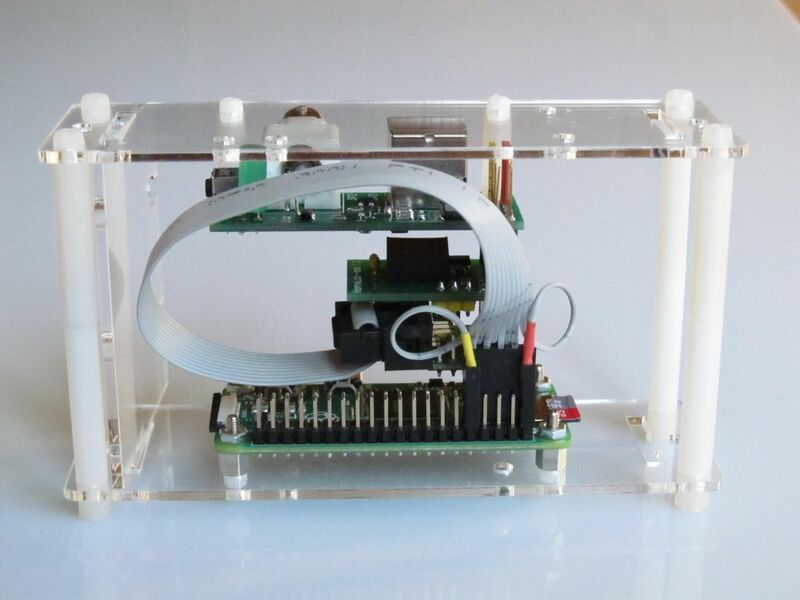 Want to buy the stand for Raspberri Pi Zero? See here or contact us.